- I'm thankful for the beat up old Pentium 4 computer that a good friend gave to me. It's slow and and sluggish, but it works. A lot of my writing is done on that old machine, including this blog post. - I'm thankful for Scrivener, the software I use for writing my fiction. It's tailor made for writers and has features I still haven't explored. It even runs well on the old Pentium 4. - I'm thankful for all the teachers that made sure I had a decent education. I wouldn't be able to read and write if not for all the years and hard work they invested in me. This is a gift I make use of daily! - I'm thankful for books. In a world of HD televisions and Blu-Ray movies, I can still find some of the greatest entertainment in their pages. - I'm thankful for the people who encourage and inspire me. Without these folks, I'm sure I would never have decided to follow my writing dream at such a late age. If you think you might be one of these people I'm talking about, then you're right. - I'm thankful for Facebook. I certainly wouldn't have found the people who have really lit the fire in me to write without it. - I'm thankful for the cup of coffee that I've been drinking as I write this. It's such a simple pleasure in my life, but I'd hate to go through a morning without it. I could probably go on all day long about things like these, but I won't. It's Thanksgiving day, which means I'm not working my day job and I get to spend time with family that I don't often see throughout the year... And for that, I'm thankful. I hope you all have health and happiness on this holiday, and in every day that follows. Don't forget to be thankful for the small things in your life, as well as the big ones. It's The Most Wonderful/Dreadful Time Of The Year! Those who know me well probably knew this little rant was coming. Yes, it's that time of year again, isn't it? Halloween has come and gone, and Thanksgiving is right around the corner. Yet already we see the telltale signs of Christmas. I just returned home from the grocery store. I was only there to pick up a single item, then be on my way. As I walked in, Silent Night was playing over the store's PA system... And it made me ill.
Before you label me as some sort of Grinch or a Scrooge, please read on. This isn't about hating Christmas... Quite the contrary. No matter what your belief system is, Christmas is universally known as the time of "Peace One Earth, Good Will Towards Men", right? Well, that's what it's supposed to be. More and more, I see this time of year bring out the very worst in people. People drive dangerously because where they are going is more important that your destination. They will fight you in a store because their child must have the toy you waited in line three hours for. God have mercy on your soul if you work in a retail store and you've run out of an advertised item. Anger and aggression is all around us. So many people become blinded to what the season should be. All that matters is making this Christmas the best one yet for their family. If they have to push and shove others to do it, so be it. This is what makes me dread this time of year. So many people become so absorbed in their own Christmas, that they either forget or don't care that it's Christmas for everyone around them, too. So here is my one and only Christmas wish... PLEASE, when you go out into the world, treat others with kindness! Drive safely on the roads, your destination will still be there! Happiness is not found in material possessions, so don't fight over them! And remember, retail employees are trying to make a living, they aren't your personal holiday punching bag! OK, I do have one more wish... I wish for you and all your loved ones to be safe, healthy and happy. Not just for the holidays, but everyday. Meeting One Of My Characters... Sort of. In a previous post, I spoke about my need for visual references of my characters. I'll find photos that I feel represent what my character looks like and add them to my notes. One of these characters is an android, whom I feel is the spitting image of a young actor named Quinn Lord. Now, I just happen to actually follow Quinn on Twitter (Yeah, I follow Dan Radcliffe as well, don't judge me) and on an impulse, I sent him a tweet telling him that he is one of my visual inspirations. I knew it was probably a waste of time, but those who know me well enough know that I'm good at wasting time. So after sending, I return to the scene I'm busy writing. (Yes, I've been writing...) About an hour later, I get a notification on my phone from Twitter. I look at it and much to my surprise, Quinn responded to my message. Regarding the book I'm working on, he said "I'd love to read it when you're done!" Well, I thought that was a pretty nice thing of him to say. I returned to writing without giving it much more thought. A little later on, Quinn sent out a general tweet to his followers with a link to a flash animation. Of course, I clicked the link. (I said I was good at wasting time.) It was a rather ridiculous and annoying video of a dancing cat. I couldn't help replying to his message and told him "OK, you now owe me 2 minutes of my life back." As I chuckled at my own little joke, I once again returned to my writing. It was only a matter of minutes before my phone was giving me another notification. Quinn had replied, saying "that's fair, send me something equally annoying and I'll watch it! : )"
Obviously I couldn't just ignore this challenge, so I sent him a link to a youtube video someone had once shown me. It was a guy dancing around in a banana costume and singing (Or was it screaming?) "I'm a banana!" repetitively. Quinn later responded with "You win!!" There were a few more messages back and forth, but it was getting late for him on the west coast and VERY late for me in Ohio, so we both called it a night. I'm not going to be so bold as to say I'm now a personal friend of young Mr. Lord, but it was kind of neat to interact with him for a little while. Needless to say, he'll be getting a copy of my book... Once it's done. Please check out the website for Quinn's newest film, Imaginaerum! Most of you know I am currently working on my first novel. It's a SciFi story that I've been fleshing out for a long time. My original intent was to make this a stand alone book, but already the sequels are fighting to be written in my mind. I don't know if other authors experience this, but I seem to be having trouble focusing on the current book due to ideas for my second and even third books forcing their way into my brain. I've even found myself doing research for the third book when I should be writing on the first one. Is this normal, or am I unique in this? I've heard of other writers working on two or more books at the same time, but I'm not sure I'm up to that sort of multitasking. Perhaps this is just one more learning experience for me, as a writer. An Interview On My Blog - A First For Me! I decided to get a little help with my blog. I wanted to find someone who could go out there into my fictional world and get some interesting stories to report. So allow me to introduce the newest member of my blog staff, hardnosed reporter Charley McFarley. The chief sent me to get an interview with this kid named Joshua. I met up with him at a baseball field, watching other kids playing a game. Here’s how the interview went. Me: Hey kid, your name Joshua? Joshua: Yes sir. You must be Mr. McFarley. It’s a pleasure to meet you. The kid smiles at me funny. I think maybe he’s not too bright. Me: So what’s your story, kid? Why should my readers be interested in you? Joshua: I suspect that the most interesting thing about me is my relationship with Chance Tayler, my best friend. That’s him out there playing right field. Me: Why aren’t you out there playing ball, anyhow? Joshua: It’s not generally acceptable to allow an android to play in a baseball game. Me: Wait, are you telling me these kids won’t let you play because of your religion? Joshua: Oh no, being an android has nothing to do with religious beliefs. I am not a living boy, you see. Me: What are ya then, some kinda undead, like Dracula? Joshua: No, an android is a manmade construct, like a robot, but created to imitate a human being in every way possible. Me: So you’re a machine? Joshua: In simple terms, yes. My brain is an intricate computer that contains the most sophisticated artificial intelligence to date. Me: Why would anybody want a robot… Sorry, android… That looks like a kid? Seems kinda weird to me. Joshua: Child models, such as myself, are often used for the purpose of teaching and emotional support for a human child. It is my purpose to help my friend Chance acclimate into the lifestyle of a normal boy. Me: So he wasn’t normal before? Joshua: It would be more accurate to say his situation wasn’t normal. Until recently, Chance had spent most of his life in the hospital with a degenerative muscular disease. He had never had the opportunity to grow up around other children, so he lacks social skills and is very self-conscious. Me: Looks like he’s got friends now. So why would he still need you? Joshua: I’m his best friend. I think it’s safe to say that he loves me, and I love him. Me: How can a machine love somebody? Joshua: My programing is the most sophisticated artificial intelligence ever created. It includes autonomous emotional algorithms that are not in my control, just as humans can’t control their own feelings. Me: So how old are you? Joshua: My outward appearance is that of a boy approximately eleven to twelve years of age. My actual age depends on your frame of reference. For instance, if one considers my birth to be the time of my first initialization, I would be seventy three days old at this time. Me: So what happens when your friend grows up? Do you just get cast aside like an old toy? Joshua: While that is a possibility, I don’t think it is very likely. Child models like myself can be given regular upgrades, to allow them to ‘grow up’ along with their human counterpart. In such a case, I would eventually end up as an adult model. It is also possible that I would simply continue in my current form. Some humans form an attachment to androids such as myself and prefer to leave them unchanged. Me: So, you’ll never die? Joshua: With proper maintenance, I could theoretically continue to function indefinitely. However, it is possible for me to be destroyed or my memory systems to be wiped out. That would be the equivalent to death for an android. Me: Well, what happens to you when your friend gets old and dies? Joshua: I’ll be very sad, of course. My ownership would pass to a beneficiary, most likely his offspring. Me: It doesn’t seem right that you can be someone’s property when you have emotions like a real kid. Doesn’t that bother you? Joshua: Not at all. Even humans have a desire to belong to someone, so to speak. Me: But what about your rights? Shouldn’t you have the freedom to do what you want, just like anyone else? Joshua: Androids don’t need the same freedom that humans have. Our greatest desire is to serve our purpose for our owners. Me: But aren’t there things YOU want in life? Desires that aren’t about making your owner happy? Joshua: Well, I suppose would like to be a human boy, but that is an unrealistic desire. Me: You’re a fictional character, kid. Anything is possible. Joshua: Perhaps, but it doesn’t seem likely. I’m very content being an android, however. Me: Tell me about your story. What can the readers expect? Joshua: I’m sorry, Charlie. It goes against my programing to give away the plot of the story. The kid gives me that crazy smile again. Me: Thanks for your time, kid. I think I got all I need. Joshua: You're quite welcome. Please feel free to contact me if you need anything further. Joshua was an interesting kid. Maybe if the chief likes this interview, he'll let me go back and talk to that Chance kid next. Even writers need the right tools for the work they do. I thought I'd show you the tools that I find to be important for my work. The most obvious tool for a writer in this day and age is a decent computer. The PC in my office is an old eMachine a friend gave me. It's a little slow to boot up, but it does the job. The computer is only as good as the software, and I use a program call Scrivener. (http://www.literatureandlatte.com) I think it's the most incredible writing software available. It's available for a free trial, and to purchase, it's only $40 for windows, or $45 for Mac. I can't stress enough the importance of a comfortable chair. I can't speak for anyone else, but after a few hours sitting on a hard wood chair, my backside won't let me concentrate on my work. I don't always do my writing in my office. In fact, lately most of my work has been done on the porch or even in bed. So portability enters the picture. While I do have a nice 17" laptop, I find this little netbook to be much easier to carry along wherever I go. Sure, the small keyboard takes some getting used to, but I manage just fine. Being a past victim of massive hard drive failures, I can't recommend external storage enough. A simple USB flash drive not only allows me to keep my work safe, it also lets me work on any of my computers. This one is the one I work from, plus I have another that I back up my files on regularly. ALWAYS back up your data! A good writer should always have a good pen. I favor Pilot brand pens (http://www.pilotpen.com/), especially the Precise V5's. The G2's are great for a bolder line. So, those are the primary tools in this writer's toolbox. Yesterday, my dear friend and coworker Ruthie, surprised me with a thoughtful gift. It was this book, Ruins Of The Mind by Jason P. Stadtlander. 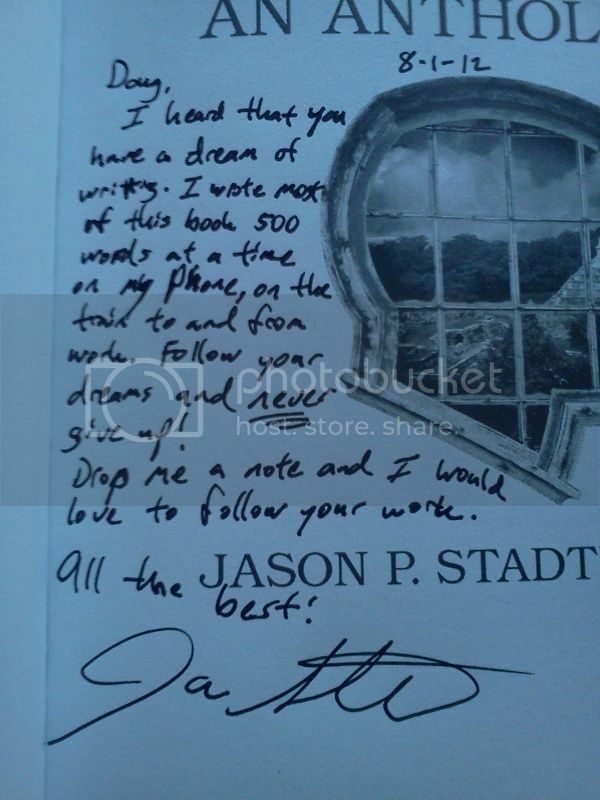 ( www.jasonpstadtlander.com ) She happened to find Mr. Stadtlander in The Book Loft, signing copies of his book. 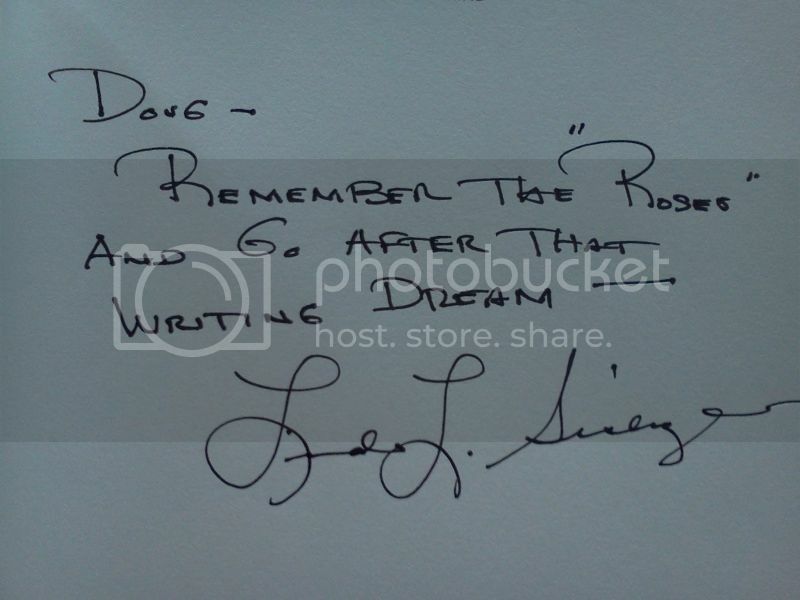 Being the wonderful and supportive friend that she is, Ruthie talked to him about my own desire to write and asked him if he could sign the book with some words of encouragement. This was the highlight of my entire day. Even the headache I had most of the day couldn't keep the smile from my face. There's also a lesson here for any other aspiring authors... Assemble your support group! As writers, we can be our own worst critic. Our own minds can and will discourage us from moving forward. Surround yourself with the friends and family who will lift your creative spirit and give you the courage to go forward! One last thing... Thank you, Ruthie. You are absolutely DARLING! Whenever I sit down to write, I have a goal of reaching at least 1,000 words for the session. I've found this to be a reasonable goal and I usually achieve it. I've managed as much as 1,200 words, occasionally. Today was different, however. Today I managed a little more than 2,000 words! I feel like this is significant and perhaps I should be excited about it, but it doesn't really feel exciting. Yes, I've accomplished a lot over the course of the day. I introduced some characters, wrote a lot of dialogue, even gave the protagonist a three paragraph monologue. Yet somehow it doesn't feel like a victory. I think the biggest problem is that I'm still not sure where the story is going. I can't figure out the overall conflict of the story and the final goal for the protagonist. When it comes to something like this, I'm the sort of person that wants to plan everything out. I've sat down numerous times and tried to create an outline for my story, but still I have no direction for the plot. Many of my friends that happen to be published authors would keep telling me to just write, and so I do. Still, no real destination in sight. Don't get me wrong, I'm going to keep on writing... But this lack of direction is becoming very discouraging. Tonight's writing session involved a scene that is supposed to be very emotional. After a few hours of writing, I have completed the scene. The problem is, I'm not sure the emotion is coming across. Let me give you a little background info first. This little paragraph occurs after an altercation between the protagonist, an eleven year old boy and his friend. For reasons of my own, I will refer to the protagonist as C and his friend as J. "J stood up and opened his arms to C. This time, C accepted the hug. The two of them stood there embracing each other the way that friends do, One seeking forgiveness, the other granting it." So what do YOU think? Does this convey the emotion of the scene? Is it cheesy and unbelievable? I invite your constructive criticism, as long as it's not brutal. Visual References. Yes, I need Them! I can't speak for other writers, but I've found that having a visual reference for my characters really helps me. When I create a character, I'll find an image or two of a person (usually an actor or model) that I feel represents the physical appearance of the character. With Scrivener (the software I use to write, well worth the money!) I can put those images into my reference folder with notes about the character. This has been working well for me, but as I work on my current project, I went a little further. Many of the characters in my story are kids who play baseball. 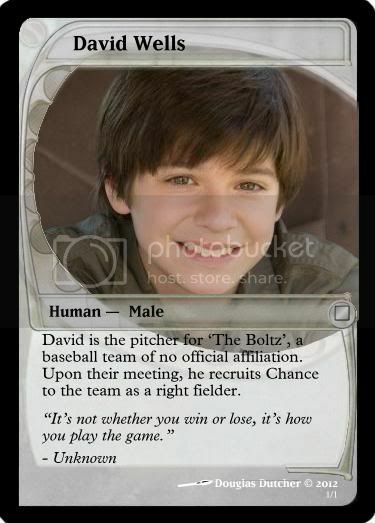 As I was writing a scene, I thought it would be neat to create baseball cards for my characters. I'm not a wizard with Photoshop or anything like that, so I looked around for software made for the purpose of creating such cards. While I didn't find anything specifically for baseball cards, I did find one for creating custom Magic: The Gathering cards. The above image is an example of one character card I've created for my current project. The photo is a young actor or model, so obviously I don't hold any rights to the image, but he fits my vision of this character's appearance. This easy to use program (Magic Set Editor, for those interested) allows me to create a card with an image and info about that character. I also like the 'flavor text' at the bottom where I can add a quote. Sure, it isn't a baseball card, but it's a unique reference I can print and keep as a memento. One obvious pitfall is that it's really easy to get caught up creating these cards. I could easily spend an entire day playing with this program. Fortunately, I've managed enough self discipline to avoid that trap. Maybe once I'm a bestselling author, I'l be able to put out a set of trading cards for my books... But for now, I think I'll go write.